Is This Who Nathan Fillion Is Playing In Guardians Of The Galaxy? We know that Nathan Fillion has a small cameo in Guardians of the Galaxy, but who is he playing? Take this rumor with the usual heaps of salt, but if it's true, it's a huge spoiler for the movie. DO NOT READ AHEAD unless you're willing to risk ruining one of the movie's big surprises. 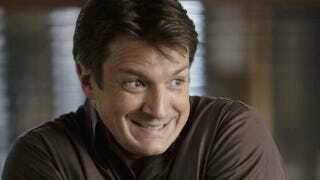 Update:Nathan Fillion has debunked this particular rumor! Let the speculation continue. Now the folks at Schmoes Know claim to know the identity of Fillion's character: Cosmo, the cosmonaut dog. The rumor is that Fillion will be appearing in a voice role, not as his usually upright self. Now, we don't know yet if Cosmo is in the movie—it hasn't been confirmed either way—but Fillion has done voice work before, including voicing Hal Jordan in various productions and playing frat guy Johnny in Monsters University, so him taking a voice role for his cameo makes sense. But as with all rumors, we'll have to wait and see how this pans out.